UK wages grew at their fastest pace in almost three years during the first three months of the year, according to official data. Average growth in earnings, excluding bonuses, rose to 2.9% in the three months to March after a 2.8% rise in February. The latest reading is more than the Inflation rate of 2.5% in March. It follows a year in which wages fell against inflation. Real wages grew by just 0.4%, according to the Office for National Statistics (ONS). A decade on from the financial crisis real wages are still worth £24 a week less than in 2008, according to the TUC. Wages are not forecast to return to their pre-crash level until 2025. "Working people are still not getting a fair deal," TUC general secretary Frances O'Grady said. "Millions of jobs do not pay a real living wage. And average weekly pay is still worth much less than a decade ago after the longest pay squeeze for 200 years." The number of people in employment reached a new record rate of 75.6% after employers hired a larger than expected 197,000 people in the first three months of the year. Employment rose to 32.3 million, the highest number since records began in 1971. Unemployment fell by 46,000 to 1.42 million. The jobless rate stayed steady at 4.2%, the lowest since 1975. 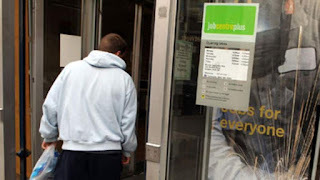 Senior ONS statistician Matt Hughes said: "With employment up again in the three months to March, the rate has hit a new record, with unemployment remaining at its lowest rate since 1975. "The growth in employment is still being driven by UK nationals, with a slight drop over the past year in the number of foreign workers. It's important to remember, though, that this isn't a measure of migration. "Growth in total pay remains in line with inflation, meaning real earnings are flat on the year."